The first veteran to move into our newly-constructed Valley Brook Village in October 2013 had served in Vietnam and had been homeless for decades. When he opened the door to his one-bedroom apartment, he had the first place to call home in more years then he could remember. Valley Brook Village was something we had envisioned since 2006 when the first wave of our transitional housing residents prepared to graduate from the program. Some veterans who had progressed so far in the program were relapsing back to addiction or depression, anxious about going out on their own. We recognized that a portion of the homeless veterans we served needed an on-going and more intensive safety net. A place where they could continue to be part of a community with other veterans as peer support and staff available to address their health and mental health needs. A permanent place to call home. Today, Valley Brook Village on the Lyons VA campus is home to 61 formerly homeless veterans and an additional 50 units are currently under construction. We provide veterans residing at Valley Brook with on-site support and employment services to help them return to work, access healthcare, maintain their recovery and succeed in living independently. Community Hope has enhanced services for the veterans with multiple chronic health conditions by establishing a Veterans Peer-Led Support Services Program. Veterans are helping their fellow veterans to manage and improve their health and transporting them to healthcare and recovery services. Phase II of the Village is slated to be completed and occupancy of the 50 new units is to begin prior to year-end 2019. Check website in July/August for status of applications being accepted for the 50 new units in Phase II. 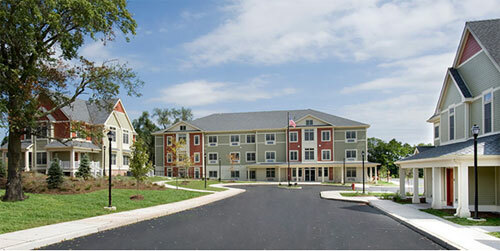 These are rent subsidized units intended for veterans in need of affordable housing.